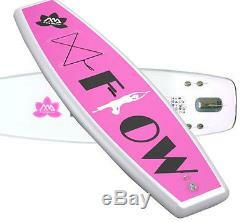 The new FLOW board features a flat front and tail for maximum stability. At 9'9'' long, 32'' wide, and 6'' thick it is great platform for Yoga. Durable double-wall drop stitch PVC&##xA0. EVA Deck: front all wrap-up EVA pad. Diamond groove, heat embossed, maximum traction and durability. Stainless steel D-ring on tail for safety leash&##xA0. Elastic bungee cords for cargo. Optimum air pressure in all conditions, up to 15psi. The item "Aqua Marina Flow Yoga Inflatable Stand Up Paddle Board SUP-515888" is in sale since Tuesday, January 24, 2017.